Tin Pan South wrapped up its 2014 events with numerous performances this past weekend. Performers including Joe Don Rooney of Rascal Flatts and writers including Dave Berg, Stephanie Bentley, Pat Alger, Linda Williams, Brian Wright, Ruston Kelly, Jeff Stevens, Wynn Varble, Phil O’Donnell, Hugh Prestwood, Linda Davis, Nathan Chapman, Amy Grant and many others filled venues across the city to celebrate some of the best tunes Music City has to offer. 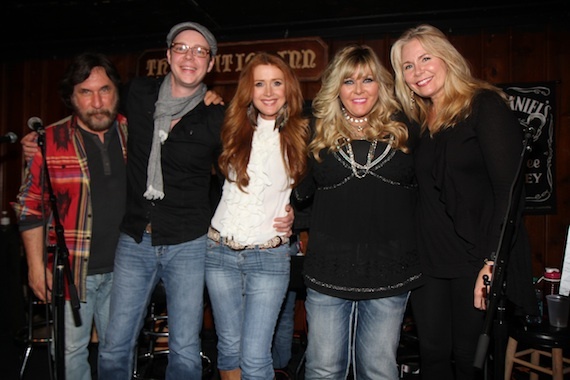 Stephanie Bentley, Josh Leo, Jamie O’Neal, O’Shea (Jay O’Shea, Mark O’Shea) at Station Inn.